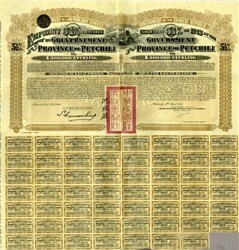 GROUP OF 5 BONDS - Beautiful authentic uncancelled bearer bond certificate from the Government of the Province of Petchili issued in 1913. This historic document was printed by J. Verschueren - Anvers and a vignette of sampans on river with mountains in background and has been hand signed. Text in French and English. Signed at Antwerp, Belgium, April 4, 1913. Printed signature of Chinese Minister in Vienna and signed by agent of Banque de Reports, de Fonds Publique & de Depots. 55 coupons attached. Republic of China, Government of the Province of Petchili, �20 bond, 5 �% Gold Bond of 1913, Capitalization of �500,000 Sterling. Condition: Vertical crease fold. Pinholes. 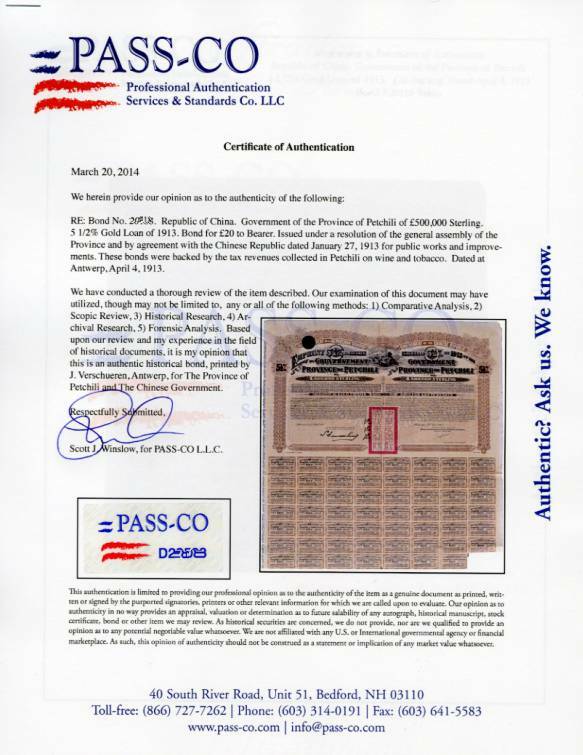 We sell this authentic uncancelled bond as a collectible and make no representations as to whether or not they are redeemable. This bond will come with a PASS-CO authentication.